Is the world food system broken? “Food policy challenges and strategies: Australia, the Indo-Pacific region and beyond"
In association with the National Rural Press Club, we proudly invite you to a presentation by Dr Shenggen Fan, Director General, International Food Policy R­esearch Institute (IFPRI) co-hosted by the Crawford Fund, the Australian Centre for International Research (ACIAR) and the Department of Foreign Affairs and Trade (DFAT), on 11 February 2019 at the National Press Club, 4-6pm, including a free networking reception. 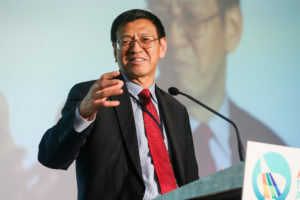 Dr Fan has been the Director General of IFPRI since 2009 and is world renowned for his work on transition economics, global food systems, and agricultural and rural development. He is one of the Champions of Target 12.3 of the Sustainable Development Goals, dedicated to inspiring ambition, mobilising action, and accelerating progress toward cutting global food loss and waste. Food systems can play a key role in nurturing human health and supporting environmental sustainability, yet currently, they are threatening both. The Australian and global food system faces major trends and challenges related to rapid urbanisation, changing diets, climate change, political uncertainties and anti-globalisation sentiments, which also have significant implications at national and regional levels. Is the world food system broken? Address: The National Press Club, 16 National Circuit, Barton, Canberra. Time: 4-6 pm including a free networking reception. This is a free event so RSVP as soon as possible to reserve your seat.